Last weekend I went to a Memorial Day cookout with future Mr. Bites’ extended family. One of the side dishes brought to the party was Doritos Taco Salad. That’s right, Doritos Taco Salad. I swooned. I had seconds. I wanted to eat the whole massive serving bowl full. You know how people go nuts over the Doritos taco at Taco Bell? That’s how I felt about this salad. When I got home I immediately googled it and a bunch of recipes came up that looked similar to the salad I was still dreaming about. I couldn’t wait to lighten it up with my own spin and share it with you all. I love the taco seasoned meat flavor with nacho cheese crunch of Doritos and the sweet, tangy, tomato-ey Catalina dressing. The original salad I tasted used French dressing, so you could certainly use that instead. Feel free to get creative and experiment by adding in additional ingredients if you like – beans, corn, black olives (will affect nutrition info). I kept it simple and it came out amazing, but there are tons of ways to customize it to your own tastes. When I measured my finished product it was a little over 14 cups total, so if you’re bringing it as a side dish to a potluck or cookout, it’ll probably serve around 14 people. If you’re serving it at home as a main dish I’d consider 2 cups to be a serving, so in that case it would serve 7 people. Make sure not to add in the Doritos and salad dressing until you’re ready to serve so that the whole dish doesn’t get soggy. Another pro-tip: if you’re worried you will be unable to stop eating them if you open a large bag of Doritos (like I was), they sell 6-packs of 1 oz bags. Use four for the recipe and then you’ll just have two individual, pre-portioned servings to eat later! OMG looks like HEAVEN! My only problem would be what to do with the rest of the doritos bag once it was open!? Can’t wait to try this! Another gem Emily! Years ago my mom found a recipe like this using Fritos and Western French (similar to Catalina) dressing. Ours also adds black olives, green peppers and onions. I’ve never thought about Doritos though. This looks great. I really love baked Doritos. I’ll have to try it with those. I’ve seen this made with ranch dressing as well. I love ranch, but I’ve always prefered this salad with the Catalina dressing! Just had this for dinner! My teens loved it and so did my husband. This is a keeper. Thank you for your amazing recipes!! I don’t use tomatoes I put jar of salsa in the meat when its done and no dressing! Its the bomb!! Get asked to bring it to all family functions, weddings, cookouts. Give it a try! The recipe I have for this uses Thousand Island Dressing! That’s the way I have always made it. People who swear they don’t like 1000 island LOVE it and always ask me to make it for them! I am 37 yrs old and have been eating Doritos in taco salad since I was a little kid… Its the ONLY way me or my family make it…. I thought Doritos was a common thing in taco salad….???? Years ago I made this and used the dressing. Now, we love it with salsa. Homemade salsa. It makes it even healthier. Oh, we do not mix the salsa in with the lettuce but put it on top with our Doritos. What if I blended up salsa and used that as dressing since it’s zero points? How would that affect the points? What if you used ground turkey and fat free Catalina? Does it affect the points enough to be worth it? Love it! We make this several times a year but add salsa and black beans to the recipe. Another way to make it a little healthier is to use 1-2 T chili powder, minimal salt and a little water in the ground beef rather than the package of taco seasoning. Thank you, Emily! This sounds a lot like the taco salad my mom makes, but way more WW friendly. I will add cauliflower broken into tiny florets and scallions. The more crunch, the better! And knowing I can have two cups of this for only 8 points makes me very happy, indeed! BTW, I will use Kentucky Bison instead of beef. Even leaner, and deeper, richer flavor! Made this for dinner tonight after a hard workout- it was awesome!!!!! Came together so quickly and tasted exactly like the fuller fat versions! There were 2.125 oz bags of Doritos in the full-service deli of my grocery store (and I bet in convenience stores, too). You can buy two and have basically no leftover chips, if that’s a problem. And, the salad was delicious. I halved the recipe, and it was just perfect for the three of us! Ha ha, we both made Dorito Taco Salad the same week. I love this salad! There’s a place around here that uses green goddess dressing in their taco salads – I haven’t been able to find a low point one, but it is delicious! Maybe worth the points if you have a 1 cup serving instead of a 2 cup. When my family had this (every summer almost once a week as a kid), we crunched up doritos on our plate so they didn’t get soggy. Ok how many servings are there in this? When I put in my recipe it’s coming out to 6-8 pts / serving. Hi Bailey, the number of servings foreach recipe is listed directly underneath the recipe title in the recipe section of the post. In this instance the salad makes about 14 cups. Do you just add the dry taco seasoning to the meat? Or do you follow the directions on the back of the taco seasoning mix package? Yup, just add it to the meat! I made this today, it is delicious! We all had seconds. This is going to be a go to meal for us. Thanks. My family has made this for years. Our variation is too crumble the Doritos as small as you can. Add light red kidney beans, mexicorn and onions. Also – the best dressing is equal amounts of mayo and salsa mixed together. You control the amount of heat. Delicious! Exactly how I’ve eaten it for 40 years! Maybe not as healthy- but mayo with salsa makes it so creamy! Great way to get kiddos to eat lots of veggies too!! I made this last week and it was a big hit! My husband loved it. I did fat-free Catalina!! I grew up eating this salad. My mom used to make it for us on the weekends and we all loved it! Thanks for the lighter version…I can’t wait to make it this weekend!! This makes 14 cups??? What are you supposed to do with all the leftovers? I’m assuming that it would get soggy. We’re only two people, even if we had this as a meal, that’s only 4 servings. What do you suggest for the remaining 10 cups of salad? Well it makes a large quantity because it’s a potluck salad. Feel free to halve or quarter the recipe to meet your needs! You don’t have to make it all at once. This was amazing. This is my first review I’ve ever written and I just had to do it. I made it exactly the way Emily did and I’m glad I did. The only thing I did was split the recipe in half and made it twice. Just so it would be fresh the next day. Awesome recipes! First time I ever had a salad that filled me up! I’ve been making your recipes for over a year now and have never written a review! I just brought this recipe up to make it for the THIRD time now and figured it was about time to show you some love! this is absolutely delicious and EASY, especially when i get off work late!! thanks for all your fabulous recipes. my boyfriend and i love them all, especially the “cupcakes”, buffalo chicken quinoa (OUR FAVORITE!!! ), and your skinny spinach and artichoke dip that i make for all potlucks (even thanksgiving!!) thanks again for your delicious food. I loved this!!! My kiddo loves Doritos so it was an instant hit and we’ll be putting this in the weekly rotation for a while! Thanks! I’m so glad I found this recipe! My ex’s mom made this all the time (said it was her own recipe that she created which we know is a fib – apple didn’t fall far from the tree) and it was really yummy! I’ll have to grab some ingredients and make this soon! I make this but i use 1/2 italian dressing and 1/2 french dressing mixed together! Delicious! we make this pretty much like this but we add rinsed and drained black beans, diced onion, and use the salsa verde doritos instead. So I just found out that MyFitnessPal has this AWESOME feature where I can copy the URL of the recipe, match up the recipe, and swap out ingredients to match what I’m making (like using our store’s brand of something in a recipe). For this, we did the regular Catalina, regular cheese, and 85/15 beef (fiance does the meat shopping at Costco so this is what he picks up). Only about 34 calories more at 184 calories per serving. Not too shabby! This one is another winner in our house. Thank you Emily! I made this taco salad back in 1973. I also add two cans of red beans, 1 can drained, and I used Zesty Italian dressing. This has been a hit in my family for years…I use Western dressing, which I hate on regular salad but it works in this recipe. Also, for finicky people or make ahead…leave chips , dressing, tomatoes, and cheese off until ready to eat or set up like salad bar and let everyone make their own and have a variety of dressing…my kids love it with ranch. Made this salad salad-in-a-jar style last week, held up really well all week. I made it as-is, except I added black beans to the meat mixture. So delicious! Definitely a keeper! I made this for a football party this weekend, substituting lean ground turkey for the ground beef. It was amazing, and disappeared FAST! Thank you for this recipe, it’s a new fave for sure! Make this recipe often, and for an on the go option you can make ‘taco salad in a bag’… just buy the single serve packages of doritos, crush them up, open the bag, add all of your ingredients, shake and eat it right out of the bag. Great for busy families who want a healthier option for eating in the car and so fun! So, for leftovers, do you just at this cold? Because I’m assuming when you prepare it originally, the meat is still warm. Omg, what are you doing to me) It looks gorgeous like a dish from paradise. And of course special thanks for the pro tips. Now I hope that I’ll be able to cook something like this. Stumbled upon this when I was looking for new recipes before I went to the grocery store! Came straight home and made it for dinner! Absolutely delicious!! Thanks for the great idea! We used to make this a work 30 years ago, but we used a creamy Italian dressing. I had forgotten how delicious it was. Gotta make! WOW! I just made this tonight and it is so good. Imagine you make a taco snd it falls apart on your plate so you just pick at it. That’s exactly what this tastes like. I was a little hesitant to use the French dressing at first, but I did use it and I didn’t even notice it. I can’t wait to make this again!! I used original Doritios yellow & orange bag had a good taco flavor in fact I would say a Taco Bell type of taste…with a dollop of sour creme an favorite beverage GUYS ! you know what I am talking about….yes sir..
Hi Emily I live in the Spokane, Wa. area and have been eating a taco salad very similar to your salad recipe for over 30 years. 2 cups of your favorite type cheddar cheese. 12 oz. bottle of Kraft Italian dressing + the other 1/2 pack of taco seasoning. I open the top on the dressing bottle and pour out 1/4 of the dressing into a cup add the taco seasoning into bottle and shake, shake, shake… add back the dressing from the cup and shake some more. This makes it easier to mix the two without getting clumps of dry seasoning inside the bottle. The last thing you add into salad then mix all together. For potluck’s don’t add meat mixture, chips and cheese until you are just ready to eat. I love our Taco Salad I learned from my first job… very similar to this except the dressing is sour cream and green taco sauce! YUM And for the extra Doritos? Use them to scoop up the deliciousness! 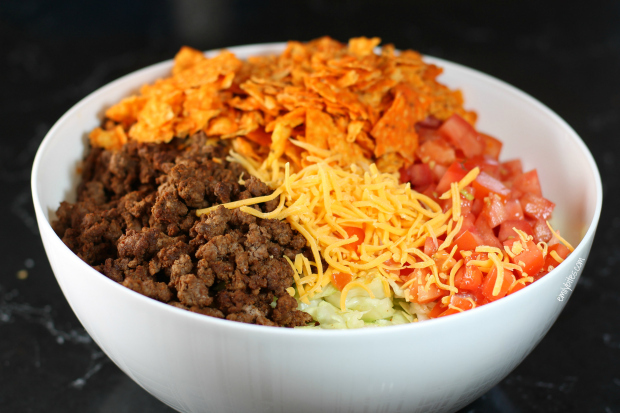 I do the lettuce, tomatoes, onions, pinto beans, cheese, and i don’t add dressing because it will make it soggy…everyone fixes their plate/bowl then adds fritos and Catalina dressing as needed….I love the idea of changing it out with Doritoes and adding taco meat!!! Yup, the dressing definitely shouldn’t go on until it’s being eaten/served.I will have to try with beans! Do you add the water to the meat and taco seasoning like the back of the taco seasoning mix instructs? You can or not…up to you! I had forgotten about this yummy summer salad! In the Midwest we added red beans and use Dorothy Lynch dressing, but can’t find it on the east coast. You bet I’ll have this in a month when I’m “home” and find Dorothy Lynch! I was introduced to something similar when I became a member at my current church. It is sometimes the “theme” for the potluck dinner. It’s not all put together like this, however. The ingredients are all presented separately and each person can customize it the way they want — we call it HAYSTACKS!!! It is SOOOOO good. I should make it more often at home. Thanks for the reminder!!! WI have been making this recipe for many years and my family and friends always love it! I also add black olives, onions and I use cool ranch doritos, as well as the nacho ones…they add more flavor. I am going to try making it with nacho cheese sometime soon, instead of the catalina dressing that I always use. (per my boyfriend’s suggestion) I hope others enjoy it as much as we have over the years. I have been making this recipe for many years and my family and friends always love it! I also add black olives, onions and I use cool ranch doritos, as well as the nacho ones…they add more flavor. I am going to try making it with nacho cheese sometime soon, instead of the catalina dressing that I always use. (per my boyfriend’s suggestion) I hope others enjoy it as much as we have over the years. I’ll have to try it with cool ranch! I have made this for years……but for the dressing I mix 1 jar of Ortega Mild Taco sauce with 1 cup of Whipped Salad Dressing. And use the Taco flavored Doritios. its basically the same as all of you have been saying there was a potluck at a place where I worked and the lady brought the meat in a crockpot warm and added all the other ingredients when it was time to eat letting the people add their own doritos and dressing. I’d like to try it with guacamole and sour cream instead of thousand island dressing that would be good to maybe some salsa with it. My daughter is 51 an she got this recipe when she was in 7th grade and we have been making it since. Ours calls for lettuce, kidney beans, tomatoes, taco sauce, avocados, shredded cheddar cheese, ground beef, taco seasoning packet, Doritos and thousand island dressing. The avocados are great in this recipe. We love it. I’ve been making this salad for 30 years…you act like its a new thing. I dont use catalina dress you use thousand island. .then use taco flavored doritos. Olives, green onions, I use veal, venison and ground sirloin make with a few taco season packs, shredded cheddar, black rinsed beans, and a jar of salsa…just before serving add the chopped lettuce and taco flavored doritos. . It was new to me! Like I said in the post though, once I googled it I found a ton of recipes for it and realized it was a big thing. Everyone seems to have their own variation and use a different dressing, but since I didn’t claim to have just invented this I’m not sure why you’re offended. All I did was lighten it up a bit and post a Weight Watchers-friendly version. If you like it better your way then definitely keep making it that way! Ok no offense, but yours is not the same recipe as hers if you add a bunch of different stuff and a different dressing. It’s like when people review recipes after completely changing them. Also, she wasn’t claiming to reinvent the wheel! I make this but use creamy Italian dressing. It is sooooo good. our dressing is equal parts Zesty Italian with equal parts Green Goddess dressing. Once you try this, you’ll never use anything else! I think this sounds delish. I will try it with Bolthouse Salsa Ranch Yogurt Dressing. Make this all the time no new buggy. My family makes something very similar, using the same ingredients, but it’s a taco casserole instead of taco salad. Ingredients are layered, and then it’s baked till hot. Baking the Catalina on the Doritos…. Awesome!!! Tostitos chips, bagged salad mix, Colby cheese ( milder and blended taste or the Mexican blend ), Western dressing. A bit smoother taste. Do not put dressing on until ready to eat, lettuce will wilt & chip will be soggy. is this served warm or cold ? Room temp usually (because I’m usually eating it at a potluck or picnic) but you can add the meat hot if you’re eating it at home – I love it that way! I have been making this for years but use Creamy Italian instead of Catalina dressing. Use spicy nacho cheese Doritos for added kick! Great recipe thanks! i have made this but instead of regular diced tomatoes add rotel tomatoes and a can of drained kidney beans. Hi, I live in australia and we don’t have catalina dressing. What could I substitute for a similar taste? Thanks. Do you have French dressing? They’re extremely similar. It’s sort of a sweet tomato-ey taste. If you don’t have that either this salad can be good with lots of different dressings. If you read through the comments it seems like everyone makes it a bit differently! I’m happy you loved it, Kim! My mother started making this back in the 60’s, but with regular tortilla chips, and Thousand Island dressing. I make it still. My family loves it. I used to make this all of time back in the mid 90’s and it was always a big hit for all to help themselves with, it make a lot! So it was a salad or dish that I passed would go far and even most of weekend at the lake house. The only difference in mine was I used Thousand Island Dressing and it didn’t need much with a little sour cream added as well. And I would also use Frito’s and not Dorito’s and would crunch them up and put in a separate bowl to add separately as they dished up the salad onto their plates. Otherwise this salad would make the Frito’s go mushy if you added it altogether in the beginning. I also added more veggies like some cukes and others and would change it us from beef to chicken and other things to make it a bit different from the same ole same ole every time. But I’d also bring other things as well. Then my Sister In Law sort of took up bring this salad as her own. But she added in the Frito’s every time, making it not so good the next time we ate it. Mine was always gone when the weekend was over. She went home with left overs every time and didn’t use sour cream or chicken. It was same ole same ole with her. I tried to give her some tips, but hey you can bring a horse to water, but you can’t make them drink! So she ended up actually throwing away most of it, what a waste! Hey, I tried, but wasn’t going to bring 2 Taco salads, I actually made this wonderful chicken salad that went like hot cakes along with a pasta salad of some type. Plus we would grill out as well. Or go out to eat on Fridays for a nice Fish Fry. I’ve been doing this for years. I use Zesty Italian Dressing instead. It’s yummy. Is this salad served cold?! Can this salad be served cold?! Sure! I’ve always had it at potluck gatherings, so it is usually cold or at room temperature. I fix this all the time but with Otts dressing and fritos.They first served at a Tupper ware party I was at.Its a big hit with my husband. should I drain the meat???? I love to use Italian dressing instead of french or catalina. Black beans and black olives are good additions as well! 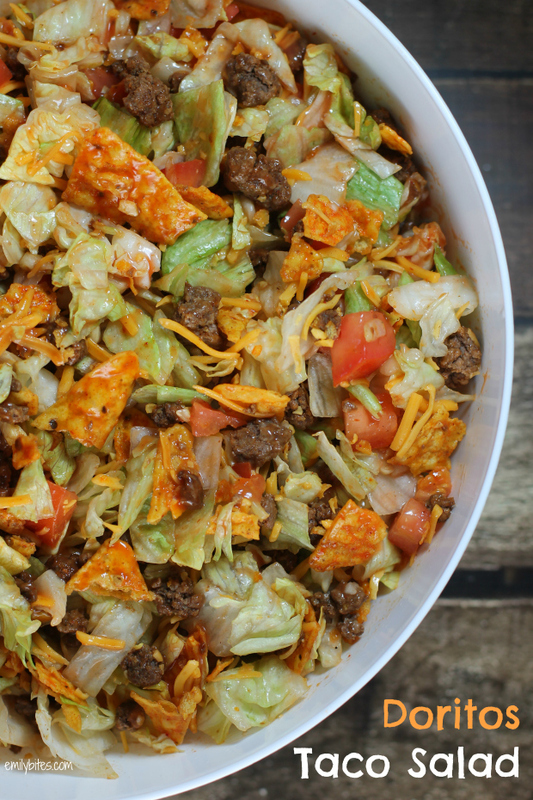 Love this taco salad! Been eating it all my life, except we use Western dressing, instead of Catalina. Now that I’ve moved from Chicago to Texas, I have to have the Western shipped to me or stock up when I go back for visits. Catalina just doesn’t have enough flavor for me. I made this today, but instead of tomatoes I added a black bean and corn salsa. YUMMY!! Thanks for the inspiration! This was delicious, thank you for the recipe. We use Thousand island dressing. 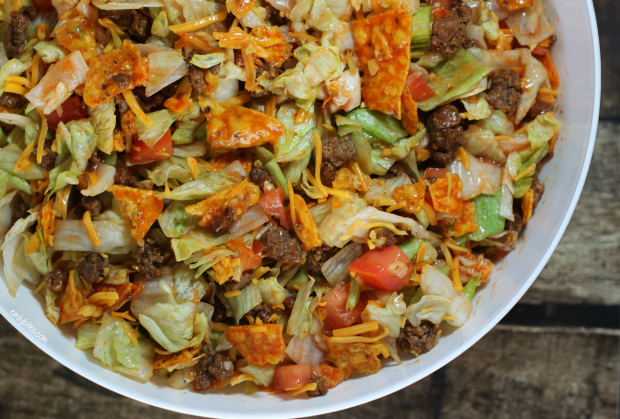 Love this taco salad and am making it for a gathering today. FYI, your link on how to cut iceberg lettuce is actually on how to wash and store it. I make this all the time and I used western dressing it is so good! This is my mother’s recipe. She has been making it for pot lucks for decades where it is always a hit. The only difference is that she uses Western dressing. I have used Catalina but it isn’t as good. Western dressing is the way to go. I just wanted to let you know that we had this for dinner and it was a big hit! My husband wanted something easy to cook so it would be ready when I got off work. He said it was sooo easy, and he followed you recipe exactly (using the lite catalina dressing). We both ended up having seconds. In my opinion, the Catalina dressing MAKES the salad. I add black beans, black olives and onions. So yummy! My mom has always made this exact recipe but with thousand island dressing…Delish! Always the first to go at the potluck every time!!! I grew up on this. My mom’s version also had kidney beans in it, put into the ground beef to heat slightly. One change I have made to it when I make it, I have switched from Catalina dressing to taco sauce. My husband won’t eat it any other way now. We make this using Marzetti Country French dressing and it is always a hit. And we also make it as a fund raiser by using smaller bags and calling it “taco in a bag” and it goes over where ever we have it bazaars or ball games. We have made this for years, but with a few changes. I add chopped yellow onion when cooking the hamburger or ground turkey, then drain well. I also add raw, chopped red onion if it is sweet or Vidalia onion. I add a can or drained, but not rinsed Ranch style beans, and 2 chopped up avocados. Right before serving, I take out about a third and save for later, then add crunched up nacho or ranch Doritos and Catalina dressing and stir well. I serve with a side of salsa and more dressing and chips. This exact recipe, including the Catalina dressing has been used for over 20 years. I have been making it for that long.Everyone loves it. I have a recipe very similar to this. It has corn and black beans and the recipe as given used Thousands Island dressing which is very good. But now I make my own dressing with mayo, taco seasoning and ranch seasoning powder. And I take left overs to work with a tortilla and make a wrap. I also use grilled chicken sometimes instead of ground beef. My family always uses Italian Dressing and occasionally adds onions and kidney beans. We also do a non-veggie version, just meet cheese, taco seasoning and italian dressing. I totally agree with the holding off adding chips until the end and I like to keep some chops on the side to “freshen” up any leftovers. It’s delicious! I went thru most of the comments & didn’t notice anyone say they RINSED their meat (beef 0r turkey). I always rinse my cooked meat to get more of the fat off. Rinse in colander with hot water. Removes at least 1/3 or more of fat & really cuts the calories, too! Trust me, when you add the taco seasoning, you will never notice. I do this for any ground meat when adding sauces (spaghetti, marinara, etc.). Make sure to run hot water down drain for a little while to keep drains from clogging over time & add a little vinegar down drain from time to time. My family has always liked shredded cabbage instead of lettuce for tacos or taco salads. If you have leftovers or if it sits for a while, cabbage does not get soggy like the lettuce. This is yummy!!! Been eating since I was a child. But, we lay out all ingredients, buffet style. Also we use tomato soup as dressing!!!! Delicious!!! We make that same recipe but with ranch dressing, very epic! I love a good taco salad. We use Zesty Italian Dressing and it’s amazing. Also we don’t use taco seasoning on the meat and we add a hint of tabasco. Been making this for years. It’s everyones favorite dish at family gatherings. My mom has made Dorito Taco Salad for as long as I can remember. It’s been a staple at my family’s gatherings and potluck. It was the meal I ate after giving birth to the my 3rd child. I tend to follow my mom’s recipe and instructions closely with this recipe. Halfway through browning the meat, she drains the fat and then adds taco seasoning. She uses the McCormick brand taco seasoning (red. sodium as we’ve all aged). She also adds onion, celery and carrots. For the dressing she combines French AND Catalina dressing (don’t know why, but it works). This is such a great do-ahead meal: cook the meat and chop the vegetables, bag them separately and you have salad that travels well and only needs to be assembled. I make my taco salad this same way but also include kidney beans. My family loves it! My aunt has been making this for years only she makes homemade french dressing with sugar oil apple cider vinegar and ketchup. I always thought it was a family recipe but I found out its not. But I have yet to find anyone who does the dressing like my aunts if you would like it feel free to send me an email and I can give it to you. I make mine with Russian dressing. It just adds a little extra zip. There is a restaurant chain here that sells what they call Macho Nachos. Basically the same recipe as this except they layer the plate with Tostitos then spoon on the meat, the cheese (to melt over the meat) then lettuce, tomato and green onions. It is absolutely to die for. The meat they use is the same as they do for their loose meat sammies called MaidRites. It’s steamed in Dr. Pepper. I make mine with the spicy chili Doritos, black olives, black beans, corn, spinach, romaine, kale, chihuahua cheese, Catalina dressing, and salsa. Spicy and great taste! I make a very similar one, just omit the taco seasoning and I use Green Goddess salad dressing. It has a tangy “bite”. You can also use Cool Ranch Domino’s and it tastes awesome too! I use hidden valley ranch dressing, we like it best!! Use the individual snack size bags of Doritos. Add the other ingredients to the bags for taco salad on the go! Or while camping !! 1 1/2 lbs. Hambuger ( the better the quality, the better the taste). (Cooked and rinsed well ). 1 LG bag “Cool Ranch Doritos”. So Yummy! Another way i’ve made it is adding green onion, using the “Taco” flavored Doritos and using Green Goddess dressing! All ways are great! I mean it IS taco salad! Do you have to use dressing or can I use salsa as a substitute? We absolutely love this – and to answer Jennifer – I don’t use any dressing and it’s great! I think salsa would be good. I make this, but I use Italian dressing. Try it, you will be hooked! My mother made this when I was a child, but we used one part catalina and 1 part salsa for the dressing. It was yummy! I plugged the nutritional info for one serving (which you have listed above) into the Weight Watchers calculator (online) and it says 1 serving is 5 smartpoints, not 4. Not sure what you did wrong, but you should probably fix this. Leftover Doritos? Is there such a thing? What’s wrong with you people?! Would there be a significant difference in plus points if you exchange the ground beef for lean ground turkey and the light catalina for fat free catalina? Wow, what a downpour of comments! Thank you for the recipe. I’ll be very thoughtful regarding additional ingredients, to make sure they stay within my goals. An easy way to break your leaves apart on iceberg lettuce is give the core end a thump on the kitchen counter and it will break loose from the leaves. Just pull it out and take off as many lettuce leaves as you want. Love taco salad with doritos and I top it with Ranch dressing instead of sour cream. I make this, but add the black olives and I use green onions and Thousand Island dressing. Amazing and simple. I make this using green onions and black olives. Try with Thousand Island dressing too!! Try Western Dressing, it changes it up just a little. It’s my favorite. I have been making this since 1975 and my original recipe called for a can of drained Ranch Style beans but black beans would work well. This was delicious! Thank you for making it WW friendly. We love taco salad. We use Pico De Gallo as our dressing, so fresh and much better for us. We also add black olives, corn, avocado and either rinsed black beans or refried beans. Sometimes we use the beans in place of the meat! Great recipe, just like my Mom used to make. I added a can of black beans, chopped green pepper, and chopped white onion. I also used the TACO flavored Doritos. My boyfriend does not like Catalina dressing so I put spicy salsa on top of his, he LOVED it!! We had this tonight and it was super. Next time I’ll add black beans. Salsa sounds good as well. Since there were only 2 of us for dinner, I mixed the components to make 2 servings. I took your advice and bought the individual bags of Doritos so we wouldn’t have that tempting open bag. I got this recipe 30 yrs ago from an old friend Renee Jahn-shinska….I mix the meat with the Catalina dressing in a large bowl and put the other ingredients in ziploc bags until just before serving. I then put in the black olives, tomatoes , cheese, lettuce & crushed Doritos. I stir really good and serve right away. Everyone always loves it and there is never any to take home from party’s which is good cause we only like it fresh when everything is still crunchy!!! Sounds delicious and refreshing. Will have to make this when I get back from Haven. Made this last night for dinner but used black bean and corn salsa instead of dressing and we loved it. My partner likes a lot of meat so it was 2 servings instead of 4 main dish salads with no leftovers. I also cooked some green pepper in with the meat. So so good. So is this 8 points per main dish salad and 4 if you have it as a side? I was a little confused about that. Love the recipe and will definitely make again. Thanks. We had this for dinner, tonight, and it was wonderful! Thank you for the recipe! My mom made this when I was a little girl before we had internet. I’m now 43. This recipe is the same except my mom added kidney beans too. My husband doesn’t like it, but tough crap. Love this salad but I’m really confused….I made it and ended up with only 5 cups of salad :-/ when I put that in my tracker it makes each serving 11 smart points! I used bagged chopped lettuce instead of a medium head of iceberg, did I not have enough lettuce? Is that what gives it it’s size? I’m curious if anyone else has run into this as well. The salad looks amazing. My challenge is how to get the Doritos flavor without using Doritos! (family is alergic yo MSG and, unfortunately, Doritos have MSG in the flavoring! This sounds delish but I was wondering if you know what the diebetic exchanges would be instead of points. Thanks. WOW! How delicious! Although I dont think the Doritos make or break the recipe, next time I would make without them to save some points 🙂 That Catalina dressing was delicious! One of my family’s favorites! I have been making this atleast once or twice a month for the past year. Quick yummy and delicious. The only alteration we do is the dressing because my husband things Catalina dressing is a bit sweet. I swap it for salsa ranch dressing from the produce section… it’d the same points as the Catalina so it’s and even swap points-wise! If I’m ever low on w.w. points I would try it wish salsa ands the “dressing” I bet that would be great! My 2yr old loves it and I have brought it to ands family bbq and everyone has requested I make it my “thing” I always bring! Sure, you can use a beef with a higher fat percentage. If you’re tracking nutrition info or WW points they will obviously change. I can’t believe the lowest you can find is 85%!! All my grocery stores sell 90% and 95%. Bummer! I have made this recipe for years, and it’s a family party favorite. I also put diced onion and a can of rinsed kidney beans. This is an awesome salad my sisterinlaw has made it for over 30 yrs now family parties get togethers you name it. She used to use cheese cubes in her salad now she uses shreded and she used to use regular lettuce now she uses the dole mixed salad with differant lettuces. She used to use french dressing now the catilina dressing. And always nacho flaverd doritos. I prefer the taco glaverd ones. She always brings every thing ready in indivual baggies, taco meat letuce cheese chips. Then assembles them at the party before serving so the salad is not saugie. My cousin makes the salad and puts kidney beans in hers. My husband and I really love this salad, If I make the full recipe, how can I save or store the balance of the salad for the next day lunch is in the event we have leftovers? hanks for your help. My mom always uses Thousand Island dressing mixed with taco seasoning and sugar to make it sweet! My ex bf’s family make this for every event and I fell in love. I think I went back for seconds, thirds, and fourths plus brought home a doggy bag. I was looking for a healthy potluck recipe that would not make me feel like I was missing out while staying in my diet. So first test run is tomorrow then I plan on it being my potluck dish for the next 6 months. Thank you so much. My mom used to make this recipe for church potlucks. The downside is if the salad isn’t finished (if making a large amount) the Doritos get soggy. So, I make the salad with everything and serve tortilla chips (Doritos are not my fave) on the side or crunched on top. I was planning to make this sometime this week for my lunch/dinner (I work at home but I still like to portion my meals ahead). Unfortunately, the lettuce around here lately is not looking terribly appetizing. Plus, I really love Broccoli. Do you think chopped raw broccoli would work in place of lettuce? I was thinking that putting the dressing, but not the doritos or cheese, in with the meat and broccoli and letting it rest a couple of hours would soften the broccoli and give it even more flavor. What do you think?